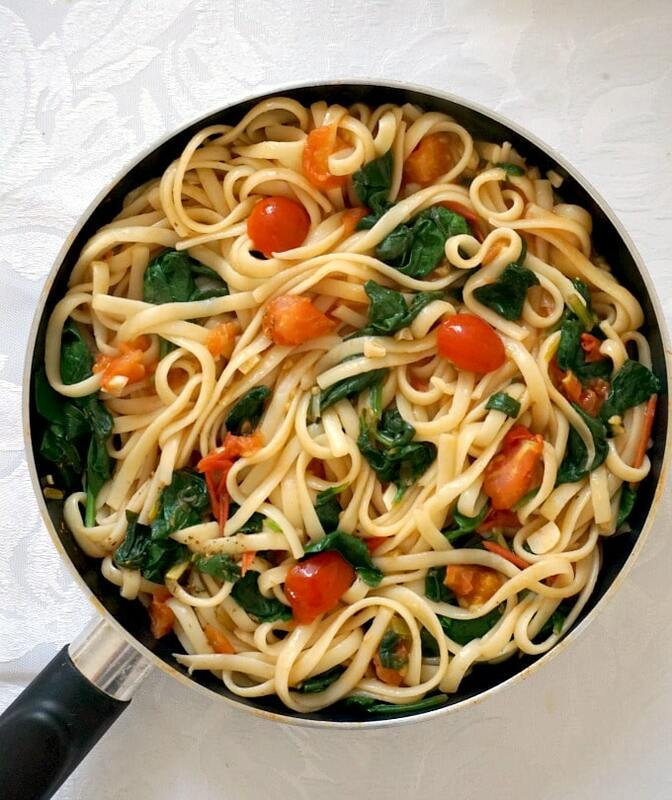 Vegan Pasta with Spinach and Tomatoes, a quick recipe ready in well under 30 minutes. Super delicious and super simple, this dish makes a great dinner for the whole family. 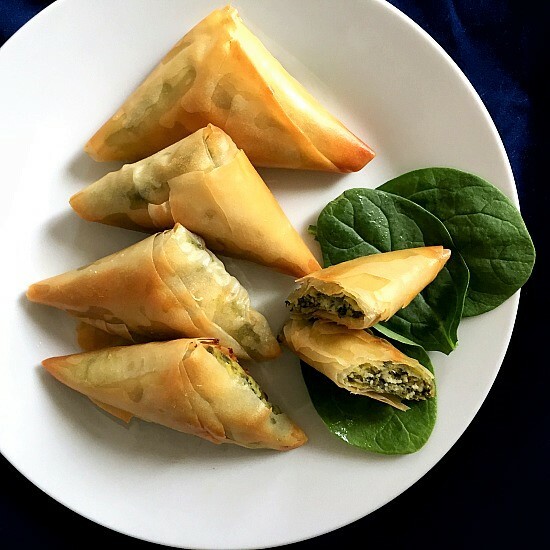 This recipe is simplicity at its best; easy to prepare, cheap, using fresh ingredients that won’t break the bank, and it’s a sure win with the whole family. Packed with flavours, light, but filling, my pasta with spinach and tomatoes proves that delicious food does not need to be at all complicated. And no need to keep buying ready-made pasta sauces to enjoy a great pasta recipe. I’m not at all that paranoid when it comes to healthy eating, but I do happen to read labels when I buy different products. Especially sauces, since I feed my little girls as well. I might be a lost cause when it comes to giving up sugar, but I’d rather keep it low or not at all for the girls. And some sauces are pretty high is added sugar, it makes you wonder why the need for sugar, when you make a simple tomato sauce. Surely, if well ripen, the tomatoes are delicious on their own, without the need to alter the taste by sweetening it. 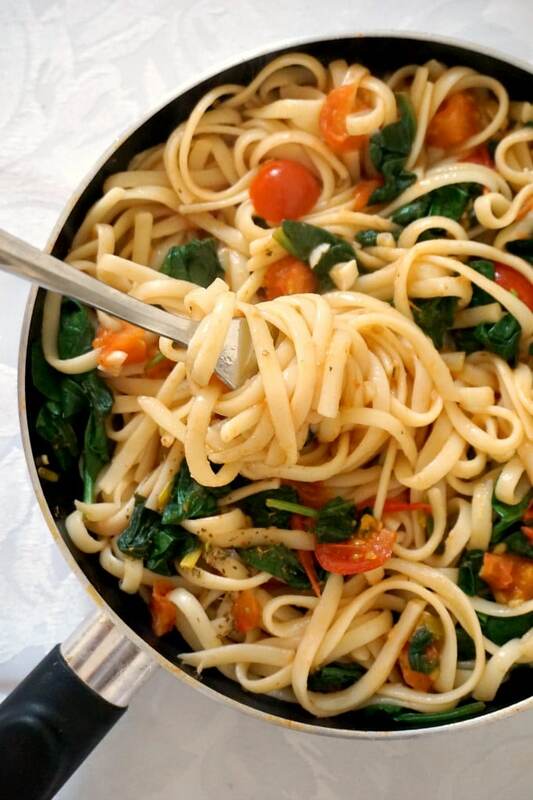 How do you make vegan pasta with spinach and tomatoes? I have used linguine, but any other shape works, spaghetti, fusilli, etc. Basically, whatever you have in your kitchen, you don’t need to buy anything special for this dish. In a pan, heat up the oil, add the garlic and spring onion, cook for 30 seconds, then add the tomatoes and cook until mushy. 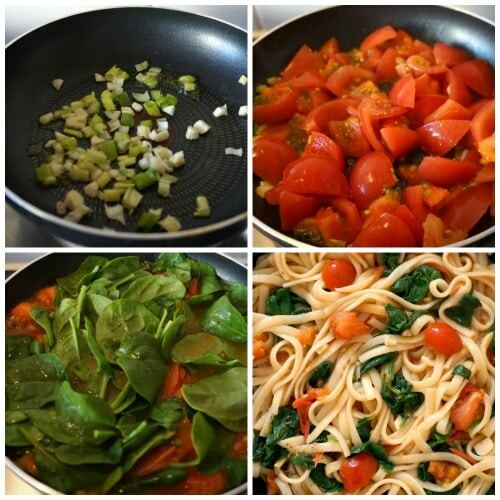 Add the spinach, tomato paste, water reserved from the cooked pasta, and cook for a further 2-3 minutes. Season with salt and pepper, and add basil or any other herb you like with pasta. Fresh spinach is fantastic, but if you want to use frozen one, not a problem at all. I like using the frozen kind quite a lot, but lately have bought fresh one as my husband likes it in omelettes. And I take advantage and throw some in pretty much anything I cook. You know me already, I love garlic. So, there is no surprise that I added quite a bit in here. It gives the dish so much more flavour, than adding salt seems unnecessary. In fact, this is a good trick if you want to cut down on the amount of salt, use dry or fresh herbs, garlic, spring onions to make any dish stand out. Back pepper can be safely use, even in dishes that are cooked for kids. And there you have, a glorious pasta recipe to take the burden off your shoulders when it comes to cooking a quick and easy dinner for your loved ones. Evenings can be stress free, at least where food is concerned. Now, if you have kids and you also need to get them ready for bath and sleep before the dreaded melt-down, not having to worry for dinner will surely come in handy. Up until recently, my evenings used to be hectic, to say the least. A forever whinging and overly demanding toddler, plus a colicky baby who used to scream the place down for hours; you can imagine what a show that was. Luckily, the toddler has becoming less whinging (still demanding though), and the colic times are way behind now. There is teething, but that is more of an issue at night than in evening. And I dare say, a teething baby is not as upset as a colicky one. At least, not with us. While little one is still trying to get her head around eating linguine, the toddler is an expert. She actually asks for pasta every single day, I suspect this sudden love comes from watching Peppa Pig who likes spaghetti. It’s impressive how some children programs can have such an influece on little ones. Especially the nursery rhymes, both girls adore them. And so do I. If you’ve liked my VEGAN PASTA WITH SPINACH AND TOMATOES or any other recipe on the blog then don’t forget to rate the recipe and let me know how you got on in the comments below, I love hearing from you! You can also FOLLOW ME on FACEBOOK, INSTAGRAM and PINTEREST to see more delicious food and what I’m getting up to. 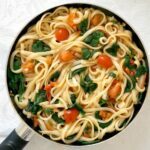 Vegan Pasta with Spinach and Tomatoes, a delicious dish that is ready in well under 30 minutes. 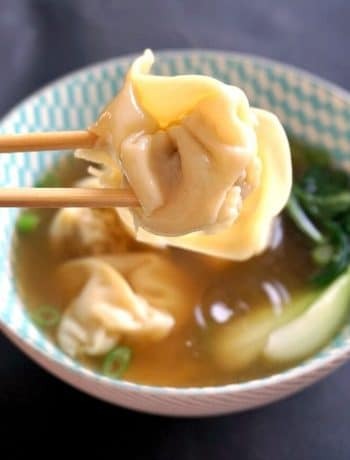 Super simple and easy to make, this dish is a hit with the whole family. When ready, reserve a quarter of a cup of the water pasta was cooked in, and drain the rest. Heat up the oil in a pan, chop the spring onion, peel and cut the garlic, and add them to the pan. Leave to cook for about 30 seconds, then add the chopped tomatoes and leave to cook for 3-4 minutes, until slightly mushy. 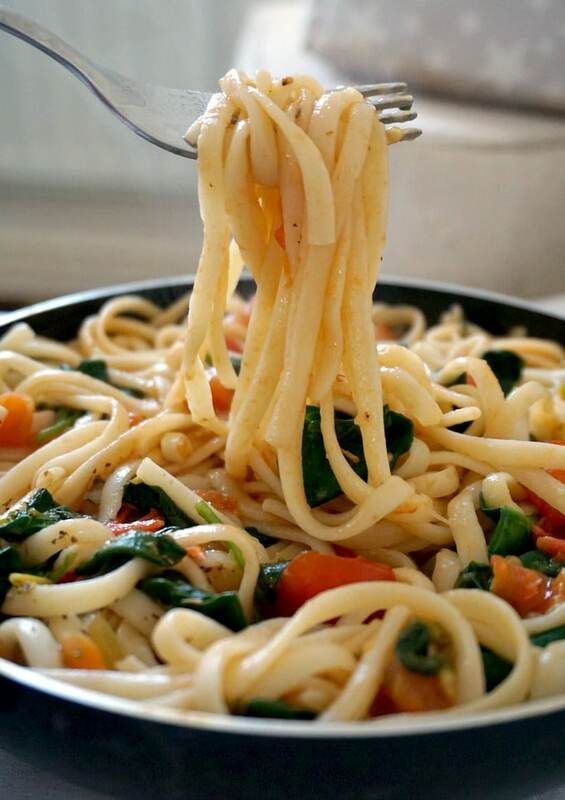 Add the spinach, tomato puree and the water reserved from the pasta, then stir and cook for a further 2-3 minutes. Add the pasta, basil, season to taste, remove from the heat. Can I cook this ahead of time. 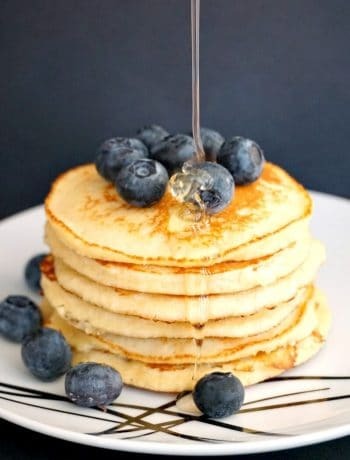 Example cook in the morning and eat for dinner. Thank you for your comment! Absolutely, you can cook it ahead of time, just pop it in the microwave to heat it up before serving, or or the stove top.